My weapon would be the spatula. When we got back from the movie I started cleaning the kitchen, which was probably not the right move, but the other day I read that Elizabeth David's kitchen was a room of "orderly clutter." That is exactly the kind of kitchen I want! And I've already achieved the clutter, so, halfway there. I'll just fast-forward through the first hour of cleaning until I to got to the spatulas, which were the exciting part. Okay, the "exciting" part. I had six spatulas, only one of which I actually purchased, sometime around 1990. I needed to put one spatula in the Goodwill box in order to achieve "orderly clutter." But which spatula? You see why I might want to be reaped? It turns out that my favorites are the two little jankety-looking old spatulas with the thin, rusting, flexible heads and the black plastic handles. These are the vintage spatulas that came down from the kitchens of my mother and grandmother and they are very precise and light and while the handles of both are gnarled from accidental melting episodes, they are my top-rated spatulas by far and not for sentimental reasons. They are simply the finest tools. I basically hate the stainless steel spatulas because they are heavy and stiff -- more like bludgeons than delicate implements for manipulating fried eggs -- and the handles get very hot. As a people, we really went overboard with the stainless steel in the '90s and '00s. But even worse than the stainless steel spatulas: the plastic-headed spatula. It is thick and dull and you feel like you're flipping pancakes with a spoon. Sound the cannon for the plastic-headed spatula. Takeaway from all this? Some things have gotten better in the last 40 years, like cars, which use less fuel, spew less pollution, and are generally safer for human use. Some things have gotten worse, like spatulas. Oh, I was in such a crabby mood after The Hunger Games. I still couldn't throw away anything associated with my mother, like the quilted potholders she sewed from old sundresses or the vintage peanut butter jar filled with rock salt from the time we made ice cream circa 1975. I will have to incorporate that Skippy jar into orderly clutter. Speaking of my lovely mother, today is the second anniversary of her death. She's never far from my thoughts but I will say that the second anniversary finds her older daughter in much better mental condition than did the first. Real life is actually full of terrible, lonely challenges. For the most part they don't involve arrows, genetically altered wasps or running very, very fast. Sometimes I wish they did. I did something with my slotted spoon -- I may have accidently thrown it in the garbage. It was an ooooooold one with a bakelite handle. I finally went to Etsy vintage and found one almost like it and I'm happy again, but I also bought a new, modern stainless one from Bed Bath & Beyond. Almost useless. I despise those plastic spatulas. Spatulas truly are a casualty of the modern age. They're like playing tennis with a log. What a nice last picture to have of someone. May the memory of your mother be eternal! I'm with Layne--that's a great picture. You have nailed my feelings on spatulas precisely! Agreed on all accounts! Your book has changed our homelife. I know that sounds dramatic and the change has been dramatic. Your blog and book have given me the confidence to try things I wouldn't have dared. Your mother would probably be kind of proud of the people you've touched with your writing and sharing your experiences. I bet she's sending you a hug everyday! Your plastic-handled spatulas with their melt marks remind me of a story from our kitchen. The other night I came in to where my wife was cooking and asked "what's burning?" She said "Nothing," and glanced at the stovetop, "unless it's this wooden spoon." It had edged over the gas flame and the tip was scorched black! I have a Wusthof fish spatula that you might want to check out. It is light and flexible and has a wooden handle. Outrageously expensive -- but it gives me pleasure every time I use it, so it was worth the investment. I am so sorry for the loss of your mother. The pain never does go away, but as you are learning, it eventually becomes manageable. I actually have a new plastic spatula that I like. I also have a drawer full of spatulas that are useless. It is long, skinny, and flexible, perfect for flipping activity. It is a Norpro "My Favorite Spatula". For years after my mom died, I kept everything. I couldn't part with anything. Gradually, I began to let things go, realizing I would never lose her in my heart. The kitchen things are the ones I will always keep. They are the best reminders of great memories. Lovely picture, by the way. Just found your blog... Oh, this post strikes a chord in my heart! I inherited my mother's addictive tendencies for kitchen gadgets. Between the two of us,we amassed enough to supply several restaurants. But my favorites are a plastic slotted spoon that has been around since the late 70's, stained with years of chili, cake batter, and everyday use. My other gadget is a vintage jar grip/bottle opener that was my grandmother's...I've never found another like it or any that have worked better. If my house were on fire, it's one of the things I will grab on my way out the door--possibly before my kids. I still have a box of unused utensils from my mom and grandmother. I open it once in a while and fondle the old bakelite carving knife and fork. My avocado green plastic handled spatula broke just before we moved so I didn't have to decide whether to chuck it or not. Lovely picure of your Mom. Oh, Food in Jars mentioned your book in her blog today FYI. My very first read of your blog.....interesting then that we have a very essential thing in common. I lost my mother 8 years ago on the very same day. And I'm here to say it gets easier and harder as time passes. Time fades the trauma of the loss, though time also accentuates all that passes in your life without her. My heart goes out to you, as those first few years have a raw tenderness like no other. I think I'll be visiting your blog from now on. Hi: I couldn't find your email but wanted you to know how much I've been enjoying reading your blog. I am so sorry to learn of your mother's passing. She was a lovely woman indeed. My husband bought me a left-handed spatula. It's the classic skinny metal kind, but with the slant the other way. But I can't use it in my non-stick pans, for fear of scratching them, and I always cook eggs in non-stick pans. I do use it in my cast iron skillets, because I've learned they are indestructible, despite my abuse. 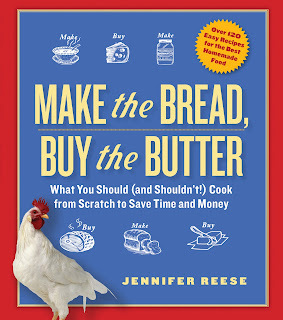 I want to thank you for your book--I haven't bought a single loaf of bread since I read it! Hi, Jennifer -- I just wanted to say that in my many years on the internet, yours is the only blog that I'm consistently excited to read. Your book was great--wonderful recipes and very, very funny (first time I've ever physically laughed out loud while reading a "cookbook"). Cheers to you and your family!